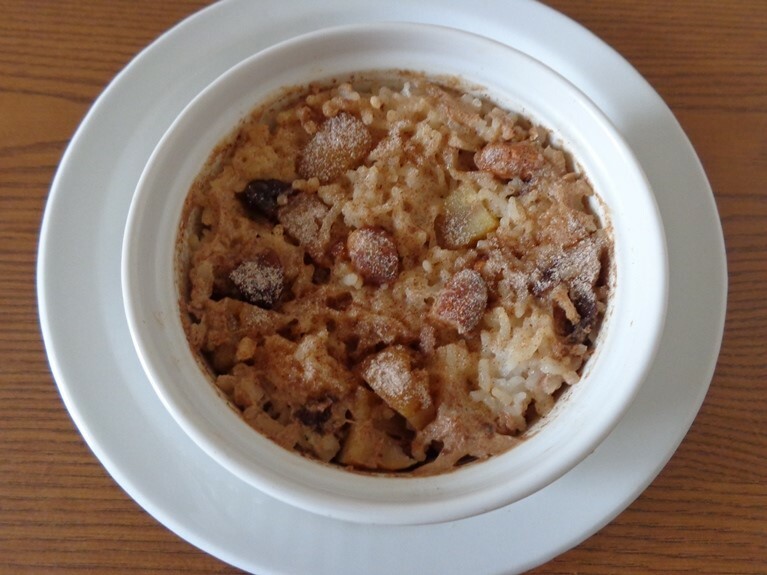 Check out this delicious Baked Caramel Chestnuts and Almond Rice Pudding was developed by VeeTee member Hidemi Walsh. 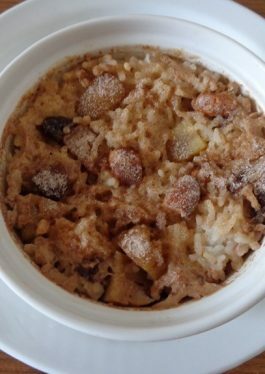 Here's her story: Unlike chilled rice pudding, I made oven-baked rice pudding which serves as a warm dessert (or breakfast). I love warm rice pudding which reminds me of Milk-gayu (like porridge) I used to eat when I was a child. When my mother made it, she sometimes added sweetened roasted chestnuts to the milk-gayu which made me so happy. I got inspired by that and made this recipe. For my twist, I made caramel chestnuts and almonds, and added my rice pudding. Also as an another twist, I baked the rice pudding so that the top gets crispy which makes it more fun to eat and adds another nice texture. 1. Cook rice following the package directions. Preheat the oven to 400 degrees F.
2. In a medium-large saucepan, put almond milk, granulated sugar, cinnamon, vanilla, salt and cranberries and stir to combine. Heat the mixture to just warm it up (don't boil). Remove the saucepan from the heat and add the rice to the saucepan. Mix to combine. 3. In a nonstick skillet, put brown sugar and water. Turn on the heat to medium. (Don’t stir) When the sugar is dissolved and big bubbles appear, stir and let it cook until the savory nutty flavor brings out. Turn off the heat and stir in chestnuts and almonds. Toss to coat. Then transfer into the saucepan (rice mixture in) and mix to combine. 4. Divide the rice mixture among 4 servings and put into four ramekins (10-11 oz. each). Bake in the oven for 30-35 minutes. 5. Remove the ramekins from the oven and let cool for about 5 minutes. Sprinkle with cinnamon sugar over the top but it is optional. Tips: Sprinkle with cinnamon sugar over the top but it is optional.